I’m here to talk to you about the subject that I’m most passionate about in life, which is vision. Living our big, bold vision! I believe that if everybody was connected to their big, bold vision in life the world would be a much better place. Think about it. Think about the light bulb. Think about the iPhone. Think about great social movements like women voting. Think about gay marriage. All of these things happened in a context when everybody thought it was impossible. And now it is vision. I started writing my first vision statements when I was seven years old, and I’ve been writing them ever since. I’m a total believer in vision. The biggest, boldest vision that I’ve done so far was starting an organization called OneWorld Now! Which is all about developing the next generation of global leaders. I worked with thousands of youth all over the world, and I realized that encouraging them to live their visions, that the greatest gift that you can give anybody, is to really expand one’s sense of possibility. This made me a believer in vision. I came to create out of this work, a Vision Toolkit, and I wanna share this condensed version with you today. 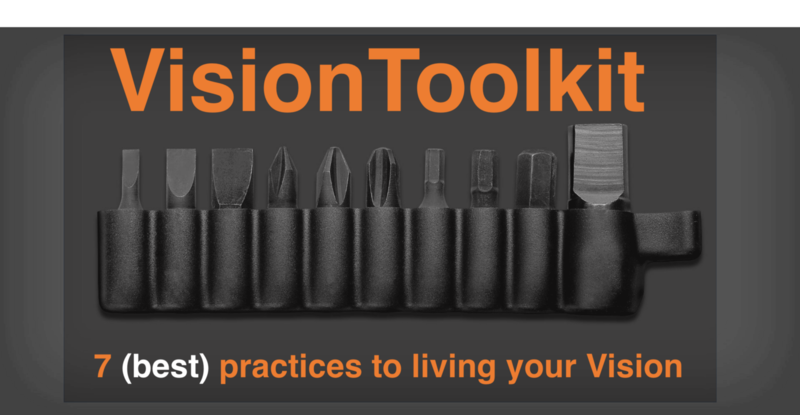 What I’m calling the seven best practices to living your vision. The first one is to be bold. All vision starts with boldness. This is how you set yourself up for the real possibility. The key here is often to give ourselves permission to imagine, to dream big, that anything is possible. And again, all vision starts with that great, great, great sense of possibility. Because if you start like this, that is what we can step into. The second thing is about being intentional. What do we mean by this? After you’ve imagined your big, bold vision, being intentional is like an internal choice. This is when you decide I’m going to go after this. And all of your actions, all of your decisions, all of your choices, all of your thoughts are aligned with your big, bold vision. This is enough of having all the ideas and things that you dream about, but it’s like what we say, marrying your vision, this is where you commit. You say that everything that I’m gonna do from this moment forward is gonna be in alignment with my big, bold vision. How do I make this real? After I’ve got this bold vision, I’ve made this internal decision? Well, there’s three main ways to make your vision real. The first one is to write it down. This is why vision statements and vision boards are so powerful, because you’ve the idea out of your head, you’ve put it on paper, you’ve made it concrete, you’ve put it into reality. The second thing is to set a date. You know when you often, when you listen to people and they say someday I’m gonna do this, someday. Well, someday’s always gonna be some day. Set a date. When we do, everything conspires to help us make that happen. And the third thing is to declare it and invite people in so that you can get the support you need. 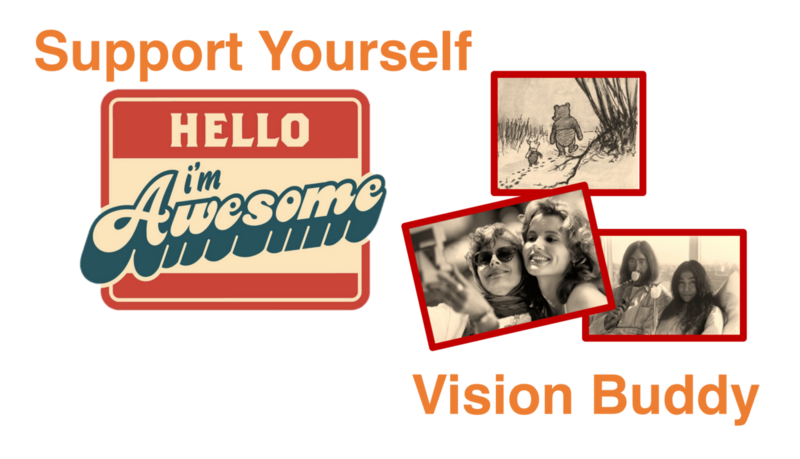 There’s two main ways to get the support you need for your vision. First is pay attention to your self talk. Are you talking to yourself in a positive, encouraging way? Imagine you were talking to your best friend, how would you encourage them? Pay attention to your own thoughts. And find a vision buddy. Find that person who sees you in your greatest possibility. That when times get rough, they will always reflect back on you your biggest, boldest vision. Because on the road to vision, things can get a little difficult sometimes, and my favorite saying is: “Hold the vision”. It’s human nature that we get excited about a vision and then we start to calculate in our mind how we’re gonna get there and then it doesn’t look like we thought it was gonna be and we give up, and we think it’s over. This is where most people let go of their visions. I say, be open to be surprises. Let go of how it looks. I have to coach even myself on this every single day. This just holding onto the vision and seeing where it takes you is exactly where you’ll still get there. I’m a big believer in experimentation. I say, for example, try these seven best practices for the next 30 days and see what happens. Experimentation is like, vision is like, we have to actually build our vision muscle. Humans are always looking for evidence to back up our underlying beliefs. So you need to start collecting evidence that this vision stuff works. So, try it; do it for a week, do it for a month, and build that vision muscle so that you can be a believer and actually increase and do bigger and bolder things. Finally, the most important thing is to own it. Own your vision. What this means is, acting in the world as if your vision is already real. Acting it now. Acting as if. What would it be like if you woke up every day as if your vision was already happening? How would you be relating to the people in your life if your vision were already happening now? How would you sleep at night? Try that experiment now and see what kind of results that you get in your life because, in fact, we’re all benefiting from other people’s visions right now. I am certain that the world would be a better place if you started living your vision right now. Thank you very much.